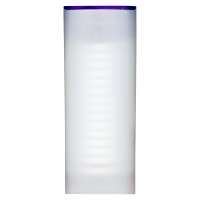 3/4盎司到1.5盎司RCM银币的空紫色盖管 Holds the following RCM silver coin sizes: 30 x 3/4 oz coins per tube, 25 x 1 oz coins per tube, 20 x 1.25 oz coins per tube, 15 x 1.5 oz coins per tube. These official tubes are direct from the mint and come complete with lids. Organize your stack and make it easy to store. Perfect for storing your investment!